Spring - Hard pruning hibiscus in the spring will provide a good display of blooms in late summer. Summer -Most trees and shrubs are better for being pruned during the month of August when the pruning cuts heal more quickly. Autumn - Take cuttings from your favourite shrubs to propagate new plants. Before planting shrubs or trees in small gardens, consideration should be given to their ultimate size so as to avoid a lot of pruning to keep them in bounds. It is important to allow shrubs to develop their natural habit in general, especially if grown as specimens where good shape is appreciated. Generally all branches which cross or rub each other or seem likely to should be removed by pruning to ensure that the balance is not disturbed. Plants propagated by budding or grafting frequently produce suckers from the base or on the stem, these should be pruned cleanly with a sharp knife. Secateurs, or trimming shears, usually leave a snag which produces another crop. Occasionally basal suckers on a shrub can be removed by a sharp tug - and will cause no more trouble. Shrubs which were originally sports occasionally produce growths which have reverted, thus a variegated plant may have a branch with green leaves. Removal by pruning should take place as soon as possible. Any large cuts should be trimmed off with a sharp knife and painted with a bituminous compound, or grafting paint. Some small flowering trees form a dense crown, especially when grown on stems as standards. To overcome this thinning out a branch here and there without spoiling the shape of the tree is the method of pruning which should be employed. Lopping branches, a method all too frequently seen, should not be done, this only results in a general chaos of young growths. Pruning shrubs should be done carefully .Branches should be cut in sections and then removed cleanly at the base or close to another branch, taking care not to leave any snags. Many gardeners still prefer to prune in the winter months, the traditional time, but in general, most shrubs and trees are better pruned in August when the cuts heal more quickly. Prunus should be pruned even earlier to prevent the incidence of fungal diseases. Shrubs such as Buddleia davidii, Fuchsia and Potentilla which flower on growths produced during the current year will benefit from hard pruning in March or April. Spring flowering shrubs flower mainly on growths of the previous year - so shrubs such as Forsythia, Ribes, Deutzia and Philadelphus should have the old flowering growths removed back to where young growths are showing on the branches. Conifers should preferably be pruned to be kept to a single leader, especially where specimens of upright habit are required. Many grow naturally in this fashion such as Chaemaecyparis lawsoniana Columnaris, but C. lawsoniana Fletcheri one of the most popular cultivars, however behaves rather differently so that basal growths should be removed where it is desired to keep to the single leader. Evergreen shrubs do not, as a rule, require pruning except to keep them within the limits of space available. Generally speaking, pruning should be carried out where necessary after flowering is over. If an evergreen shrub such as Rhododendron has outgrown its quarters it should be cut back hard, preferably in spring just before growth begins. This may result in the loss of the flowers of a very late cultivar but will benefit the plant by producing young basal growths more quickly. Many shrubs which tend to grow into a mass of twiggy growths will benefit from pruning by the removal of odd branches at times, especially if weak and straggly. 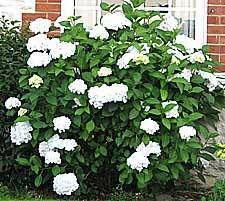 Expert advice on how when to prune shrubs. Pruning shrubs in spring to produce more flowers. Removing suckers from the base and overcrowded and crossing branches.